Hedgehogs have spiny backs with soft fur underneath. 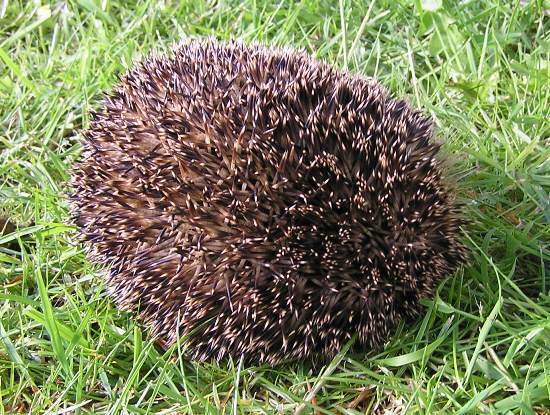 When under threat, a hedgehog rolls itself into a ball with its spines sticking out in all directions; few animals can penetrate this armour. During the cold months of winter, European Hedgehogs hibernate among dry leaves, but they do emerge on warmer days to hunt for food. The European Hedgehog pictured above is foraging for food on a bright winter morning, but if threatened a Hedgehog defends itself by curling into a ball (see below) and relying on the deterrent effect of its many hundreds of tough sharp spines. The diet of hedgehogs comprises worms, frogs, snakes, mice, large insects and birds' eggs. 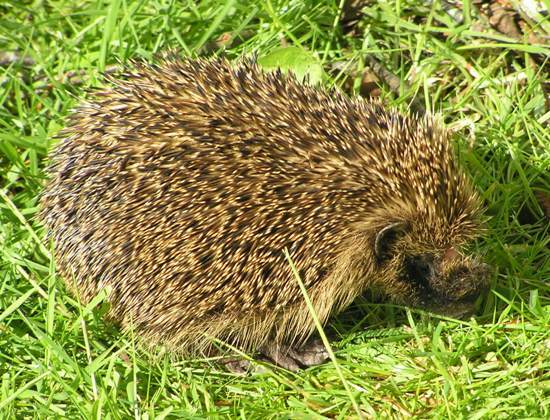 In the summer months - usually in July or early August - Hedgehogs give birth to litters of typically four to eight young.